Aesthetica Magazine Blog: Last Chance to See: Marcel Odenbach's Probeliegen, Freud Museum, London. Last Chance to See: Marcel Odenbach's Probeliegen, Freud Museum, London. The current exhibition at Freud Museum in London is by German video artist Marcel Odenbach. 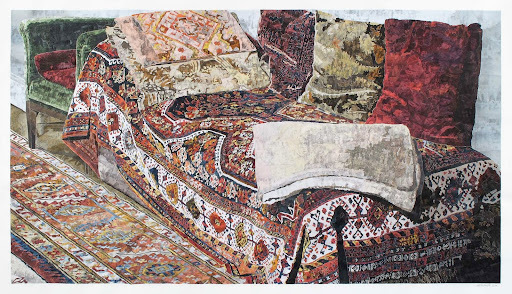 Included in the exhibition are a video and a large-scale paper collage of Sigmund Freud’s original couch. Perhaps one of the most iconic pieces of furniture known the world over, Odenbach has used the couch as the focal point of his exhibition. An artist who deals with the history of humanity through photographs, he rifles through the pictorial documentation and then employs them in a way that is artistic, painterly and subtly moving. This examination of society through art and photos creates an interesting juxtaposition which in the instance of Freud’s chair, a simple object that is in reality and in life imbued with an intense meaning which is highlighted by the presence of the photographs composing them. Built upon the foundation of Europe, Oldenbach consistently examines the brutality of humanity as it actual happened in relation to the romantic imagery we often paint of Europe. Humanity is cruel and he examines it through something that brings everyone together and possesses innate beauty: a painting. Probeliegen, which in German means to ‘test it out,’ seems the most fitting title to this exhibition devoted to Freud’s iconic couch. The couch was the site of the development of the most influential theories and ideas concerning the human psyche which would serve as the foundations for psychotherapy for centuries and are still relevant today. The couch is covered with a large Oriental rug, chenille pillows and posses an exotic quality and also a comforting aspect that is strangely inviting. The couch is still located in the front room of 20 Maresfield Gardens that served as the home of Sigmund Freud for the last year of his life from 1938-39. The room served a dual purpose as his office and his study: he received patients, read and wrote books, as well as conducted extensive research. The office was created to appear exactly as it was in Austria before he had to escape due to Nazi annexation of the country. His wife and daughter, Anna Freud, took great pains to recreate the study exactly as it was in Austria and also to maintain its truthfulness and integrity upon Sigmund’s death. The inviting quality of the room, the glasses placed carefully on the desk, the notes, the open books etc. give the illusion that someone is there, just stepped out of the room to have a cup of tea, or go for a walk. This essence of timelessness is essential to the house, particularly as it surrounds the couch. The museum itself is hard to find, blending in with the other houses on the street, it is tucked away behind a garden of beautiful roses. Upon walking in, heading to the back towards the conservatory, there is the dining room. Located there, hanging on the wall is a work of art that seems as if it has been a part of the house for its entire existence. From far away, Odenbach’s work of paper mastery looks like a painting that imitates the folds, the colours, the shadows and the magnetic appeal of Freud’s couch. Although appearing as a painting, the piece is made of paper with images dealing with 19th and 20th German and Jewish history and also the history of the Freud family. When examining the piece closely, faces and events emerge and what once was seen as a crease in the rug covering the couch. There is a smoothness and a painterly quality, the roughness of the paper only emerging after inspection. Located upstairs in the front room is where the main exhibition space is located. In here, there is a small screen with a video by Odenbach that examines history, culture and its effects on humanity. Lining the walls of the room are the preparatory sketches for the collage of Freud’s couch. What really makes the exhibition space interesting is that also located in the room is the presence of precious family heirlooms from Freud’s ancestral collection. Most notably, Sigmund’s signature hunter green overcoat, umbrella and boots that he was seen wearing in almost every photograph. In a way, the presence of his most treasured item almost garners the sense that Freud is indeed there, watching the events taking place in the front room of his London home and perhaps psychoanalyzing the effects of the art upon the people who experience them. Marcel Odenbach's Probeliegen is on until 26 June. A painting of Freud's couch. Amazing.